A little break from all the warm posts about warm birding down in Texas. Today I went out to check on a quinzhee we built at work. A quinzhee is a giant snow pile that is hollowed out to make a shelter. The one we built is very large, probably big enough to fit 15 kids or more inside. It can be up to 30 degrees or more warmer inside a quinzhee than outside. 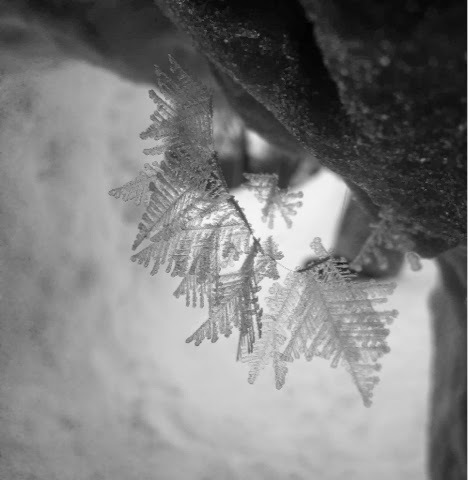 When I approached the quinzhee with my co-worker Brett we notices some ice crystals around the entrance. There must have been moist air inside (possibly from people's breath) and it crystalized as it slowly escaped into the colder air. When we moved inside, we discovered even more amazing ice crystals. Upon closer inspection we could see they had formed on a few strands of human hair that had stuck to the ceiling during the construction process. Each flake was over an inch wide. I decided to take a quick video to show off how beautiful they really were.